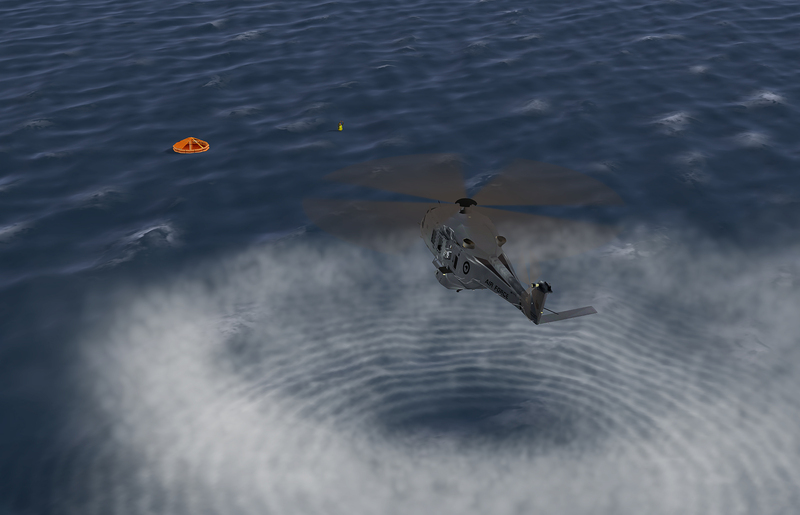 Royal New Zealand Air Force NH90 helicopter on search and rescue mission is depicted in this image generated by the new CAE Medallion-6000XR image generator. Today at the Interservice/Industry Training, Simulation and Education Conference (I/ITSEC), the world's largest military simulation and training event, CAE launched its next-generation CAE Medallion-6000XR image generator. Demonstrations of the CAE Medallion-6000XR image generator are being held throughout the show from November 28 to December 1 at the CAE booth (#1533). Ability to modify OGC CDB synthetic environments at run-time to change the terrain dynamically (CAE Dynamic Synthetic Environment). The first simulator to be delivered with the CAE Medallion-6000XR image generator will be a CAE 3000 Series helicopter simulator that CAE is currently developing for the Canadian Coast Guard. The CAE 3000 Series simulator will feature CAE's revolutionary roll-on/roll-off cockpit design and include cockpits for both the Bell 412 and Bell 429 helicopters used by the Canadian Coast Guard. "The CAE Medallion-6000 image generator has proven itself as one of the leading visual solutions for the defence market, and is used on a range of programs globally," said Marc St. Hilaire, CAE's Chief Technology Officer. "Our new CAE Medallion-6000XR will deliver enhanced capabilities for generating highly immersive and realistic synthetic environments. Importantly, we are developing our technologies such as the Medallion-6000XR to fully support and utilize the OGC CDB standard, which will facilitate interoperability and better enable integrated mission training." USAF_MQ-9_Reaper_flying_over_China_Lake_Red_Flag_1.jpg: Caption: Image of a U.S. Air Force MQ-9 Reaper remotely piloted aircraft generated by the new CAE Medallion-6000XR image generator. RNZAF_NH90_rescue_operation_2.jpg: Caption: Royal New Zealand Air Force NH90 helicopter on search and rescue mission is depicted in this image generated by the new CAE Medallion-6000XR image generator.